LITHIUM HEXAMETHYLDISILAZIDE, 0.85M in hexane (19-21 wt %) | Gelest, Inc.
Reference: 1. 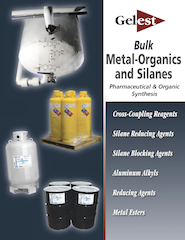 Handbook of Reagents for Organic Synthesis, Reagents for Silicon-Mediated Organic Synthesis, Fuchs, P. L. Ed., John Wiley and Sons, Ltd., 2011, p. 356-367. 2. Henegar, K. E. et al. Org. Process. Res. Dev. 2013, 17, 985.